GREENVILLE, S.C.—Dr. 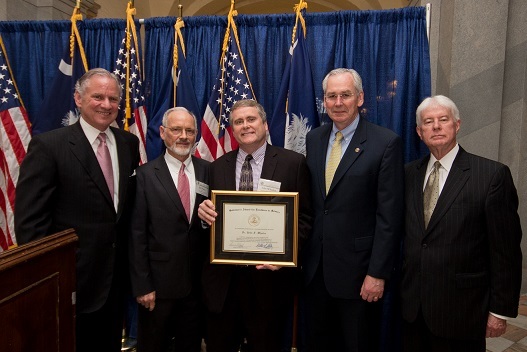 John Wheeler, professor of chemistry and Director of Integrative Research in the Sciences at Furman University, has received the Governor’s Award for Excellence in Scientific Research at a Predominantly Undergraduate Institution in recognition of his laboratory accomplishments and efforts to support science research and education across South Carolina. Over his 23 years at Furman, Dr. Wheeler has developed a research program that applies analytical techniques to a diverse group of chemical problems. Through this work, he has served as research mentor for over 130 undergraduate students resulting in more than 25 student co-authored peer reviewed publications and over 150 student presentations. In addition to his personal research interests, Wheeler has done much to promote the study of science beyond Furman. He has worked extensively with other colleges and universities in the state—as well as K-12 students—to promote science education. He has also helped secure more than $50 million in research grants statewide in support of those efforts. Wheeler was named Furman’s first Director of Integrative Research in the Sciences in 2008 with a particular emphasis on securing and administering grant support for the undergraduate research infrastructure. He has since served as the Principal Investigator for federal and private grants totaling more than $7 million in direct support of Furman science programs. He has been the Henry Keith and Ellen Hard Townes Professor of Chemistry at Furman, and he received the university Meritorious Advising Award in 2013. In 2010, the South Carolina Commission on Higher Education awarded him a Commendation for Excellence in Service Learning for his development of a Furman program that mentored underserved middle school students. Wheeler was a Knight Foundation Fellow in 1993 and a Henry Dreyfus Teacher-Scholar from 2000 to 2005. He is a member of the American Chemical Society, the Council on Undergraduate Research and is a graduate of the Riley Diversity Leadership Initiative. A graduate of Georgetown College in Kentucky, he received his Ph.D. in analytical chemistry from the University of Cincinnati. For more information, contact Furman’s News and Media Relations office at 864-294-3107.